Many Varangians yearn for the return of their great Northern Kingdom, but none see any hope of its return, and it has become more of an ideal. In Northumbria, Varangians tend to be explorers, traders, and craftsmen. They typically work as farmers, merchants, shipwrights, navigators, pilots, fishermen, foresters, huntsmen, and mercenaries. Varangians are generally tall and muscular people, with pale skin and long, straight, blonde or dirty-blonde hair (though red is not uncommon). Eye color tends to be blue, though green is not uncommon. Most upper-class men wear trimmed beards and long mustaches, while commoners tend to trim facial hair less. Concerning fashion, Varangians favor simple bright colors, often utilizing vertical stripes, combined with furs. They favor loose-fitting breeches, secured tightly around the lower legs with crossed straps. Knee-high soft boots, richly adorned with brass buttons, are currently the fashion for men. Varangian cloaks are usually long and fur-trimmed. Varangians typically eat only two meals per day, one in the morning and one at night, though times vary. They eat a wide variety of pickled or salted meat and fish, including beef, pork, mutton, lamb, goat, venison, horse, fermented shark, herring, haddock, pike, salmon, whale, mussels, eels, and oysters. Most meat is boiled or stewed, not roasted. Varangians also eat rye or barley bread, yogurt, eggs, cheese, butter, assorted berries, and honey. Vegetables, somewhat rare given the climate, include beets, onions, mushrooms, peas, and cabbage. Varangians tend to favor honey mead, milk, and mixtures of the two. Currently, most Varangians still speak their cultural language of Norsk (northern runes), but the great intermingling in Northumbria during the last century has caused most to learn Frangian as well. 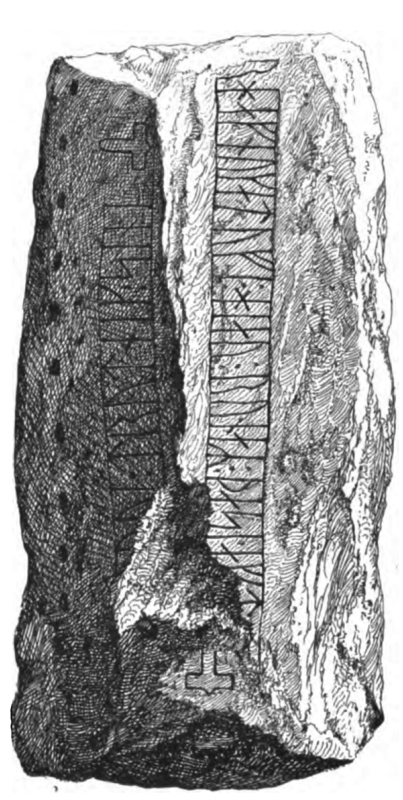 Norsk runes derive from dwarven runes, so some educated Varangians can read those runes as well. Stereotypical Varangians are tough-minded, virtually fearless, quick-tempered, highly independent, fond of carousing, and somewhat irreverent. Varangian culture currently lacks real distinction. Before the arrival of the Frangians and Zeelanders in the fifth century FR, the Northern Kingdom could boast the finest shipwrights, the bravest sailors, the most talented sea captains, talented smiths, and the most innovative farmers. They also boasted of the discovery of the iron plow, with which they could till the hard soil of the north. In the current landscape, however, only bits of this once proud Varangian culture remain, especially as the people mix freely with Frangians and Zeelanders. Those with Varangian heritage often retain their knowledge of the Norsk language, as well as the use of kennings in literature. The manner in which a person faces death determines his fate in the afterlife. Gain fame for your bravery and prowess. If possible, become a great king by your own hand. Safeguarding one’s guest is a sacred responsibility. Men should make a name for themselves. Laziness is disgraceful. Transgressors are rude and tasteless, and they should be shown the error of their ways. If they repeat the behavior thereafter, they are to be shunned. Decorate all of your belongings to the best of your ability to show your fame. Transgressors are rude and tasteless, and they should be shown the error of their ways. If they repeat the behavior thereafter, they are to be shunned. Show impeccable honor in ritual combat (fight fairly, no poison, no sneak attacks or ambushes). Transgressors are considered rude and tasteless by conservatives in society, but most people do not mind. Never claim credit for another warrior’s kill. Transgressors are to be beaten upon the first offense and killed thereafter. Never harm your liege lord or allow anyone to harm him. Transgressors are a threat to society and must be slain immediately or onlookers are guilty by association. Never harm or allowed to be harmed one that enjoys your hospitality. Transgressors are rude and malevolent and must be shunned. Before battle, pray for bravery, invoke the aid of your ancestors, and recite one’s past deeds. Istus, the Lady of Our Fate, has long enjoyed the respect of Varangians of all classes. Most Varangians worship only infrequently—before battle, before a large business venture, or before a long journey—and occasional sacrifices to Istus provide the comfort that they seek. Most pureblooded Varangians strongly believe in fate, giving them an aloof, almost detached, attitude toward life. Fharlanghn, the Dweller on the Horizon, is another favorite deity among Varangians. Many explain the stereotypical Varangian wanderlust as a blessing or curse handed down by Fharlanghan. Some legends say that it was this deity that challenged the dozen Varangian adventurer-kings to cross the Great Ocean and come to Northumbria.